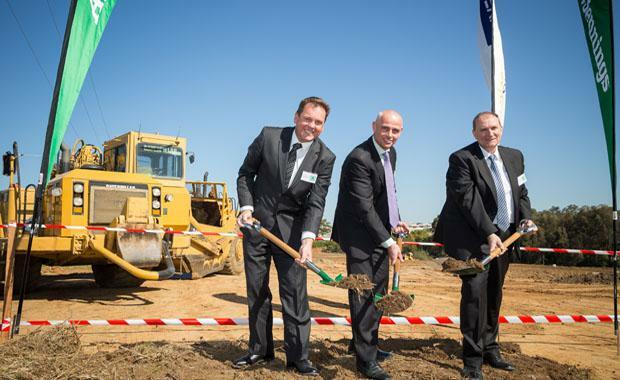 The first sod was turned at Argyle, a new master planned residential community for Elderslie being brought to life by leading residential property developers, AVJennings and Investa Land. The new neighbourhood is expected to appeal to a range of purchasers including first and second home buyers, young families, and investors due to its sought after location, range of amenities and affordable price point. Member for Camden, Chris Patterson MP, was delighted to be a part of the event to celebrate the first step in physically creating the new community that will deliver a ready-made neighbourhood to the popular area. “The Camden local government area has a high level of population growth, and I’m certain the Argyle community will greatly benefit the region by catering to this high demand for housing and helping our community to continue to grow,” Mr Patterson said. Argyle at Elderslie is a 24 hectare, 500 lot master planned community designed with modern families in mind. Upon completion approximately 1,500 people will call Argyle at Elderslie home, in a community that brings like-minded people together to share an enjoyable and fulfilling lifestyle. Conveniently located to nearby established amenity including schools, shopping precincts, services and public transport, it makes the ideal choice for those seeking a well balanced life in an ideal setting. Peter Summers, CEO of AVJennings, and Cameron Holt, CEO of Investa Land, both officiated the sod turning ceremony and spoke of the features the new community will provide to the Camden area. “The new master planned community will bring together the best of peaceful, modern, urban design for a quality lifestyle that is both idyllic and convenient. We are proud to work with Investa Land to develop Argyle, Elderslie’s newest community,” Mr Summers said. Mr Holt said he is excited to be creating a new community at Elderslie in collaboration with AVJennings. “Together we bring our collective skill and expertise to this growth market in South West Sydney. Investa Land is proud to be delivering this new community and the associated infrastructure, which will see new road links completing the needed bus links and additional open space areas. “We will also be embellishing the Oxley Rivulet. Indeed, Argyle will deliver over 3.5 hectares of open space featuring a significant riparian corridor and public parks through the development, ideal for family and friends to get together for a picnic,” Mr Holt said. Purchasers will have the choice of quality built, completed AVJennings homes and terraces, house and land packages from some of Australia’s leading builders as well as vacant land allotments. Expressions of interest have commenced for the first stage release of AVJennings homes and vacant land lots. The Sales and Information Centre is set to open onsite on 1 November.